All good Americans are saddened by the news that Justice Antonin Scalia has died. Surely, even his most vehement critics mourn his unexpected passing and would have preferred that, if he was to leave the Court, he could have done so of his own accord and then enjoyed a long, happy retirement. As an Italian-American (and a Sicilian-American at that), his appointment to the Court as the first Italian-American (and Sicilian-American) was a source of no small pride. Beyond that, he was smart and scholarly, and he could certainly write. But we do no honor to Justice Scalia to feign sympathy for his avowed jurisprudence or respect for his opinion and voting record. He himself would have preferred candor and open disagreement. Indeed, one of his truly charming and admirable qualities was his ability to take criticism as well as he could dish it out. So, for whatever it's worth, here's my candid assessment of his overall decisional record on the Court: abhorrent. Yes. For example, his position on gay rights was homophobic, on racial discrimination it was hostile to African-Americans, and on the death penalty it was medieval. Let's also be frank about the influence he exerted. Yes, he was very influential among those for whom his positions on issues were appealing anyway--e.g., very conservative scholars, very conservative politicians, and very conservative judges on lower courts. But on the Court itself, his influence was increasingly negligible. His writings could be very nasty--and personally so--and his positions were often extreme. He was openly dismissive and contemptuous of views held by colleagues with whom he disagreed, and even dismissive and contemptuous of those colleagues themselves. Indeed, he could be so nasty and extreme, that colleagues who actually agreed with him on the result in a case would often write their own separate opinions instead of joining his. 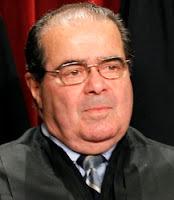 Of course, all people of good will hope that Justice Scalia rests in peace and, if the heaven in which he apparently believed exists, that he is there and will be happy for eternity. And certainly, the kind words expressed about him and the condolences to his family and others who loved him are appropriate and all decent people share them. But our sadness at his death does not make pretense or silence about his record and legacy respectful. Many, including me, view them very unfavorably. Let me finish with a sincere God Rest His Soul. Here's hoping that he is now with St. Francis and other of the gentlest souls, and that together with them he is kindly sending his blessings to all of us, including those, like me, who disagreed with him so strongly. In the coming days, on New York Court Watcher, I will discuss some of Justice Scalia's most important and representative opinions.